Do you (or someone you know) have heel pain that isn’t going away? Maybe you’ve tried everything: acupuncture, massage, even physiotherapy; the heel pain is still persistent. Today I want to explain what happens with heel pain, specifically plantar fasciitis and share with you a newer treatment approach we’re using at the clinic with great success. It’s called radial shockwave therapy . We’ve put together the highlights of what you typically experience with plantar fasciitis. Where Is It? : Under the arch near the heel; can radiate along the arch of the foot. How Does It Feel? : Can be throbbing, searing or piercing. Feels like you’re walking on a stone or have a bruised heel. When Do I Feel It? : First thing in the morning, especially the first few steps or after sitting. Feels better with some activity, but worsens later in the day. Typically worse with barefoot walking. Why Isn’t My Heel Getting Better? If you’ve been experiencing heel pain and haven’t had a thorough physiotherapy exam, then I’d highly recommend this as a first step. 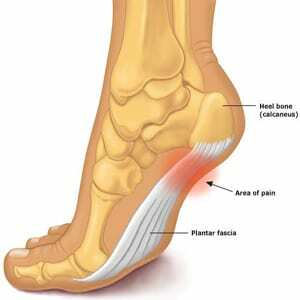 Often there are imbalances in our lower leg and foot that are putting undue stress on the bottom of your heel. Specific stretches, posture changes and various hands on treatments can be helpful in relieving the stress on the irritated connective tissue. If after around six weeks of treatment you’re not seeing any improvement then your tissue may be having a hard time healing itself and could use a little assistance. In the early stages of plantar fasciitis, you’re experiencing what’s called an inflammatory response. There’s an increased flow of blood to the area and often you’ll experience warmth, and mild swelling. This is good news. This is a sign that your body is working hard at healing the injured tissue. But over time, if the cause of your pain (e.g. tight muscles, poor standing posture) isn’t being taken care of, you’ll find that the tissue will now start to thicken and microtears develop in the fascia. Over time there’s fewer blood vessels and thus less blood flow, which limits your body’s ability to heal itself. Given this sub-optimal healing environment, we need a way to help increase blood flow to this tissue. This is where shockwave therapy comes in. Simply put: it’s a machine with an attachment that is placed against the skin and sends rapid (about 10 milliseconds) and repeated pulses. These pulses help to stimulate the body’s healing process and increase blood flow to the tissue. The treatment can be uncomfortable, but symptoms are temporary, (a few days at most) and proven to be very effective. It’s been said that knowledge is power, and in the case of plantar fasciitis, that statement rings true. One of the challenges you face is knowing what type of treatment you should be looking for. And part of the answer is knowing which stage of treatment you’re at. Shockwave treatment is for those cases that are stubborn and haven’t responded to a physiotherapy treatment program. New research suggests that it can be helpful in even more acute stages. We would strongly recommend that you consider shockwave before getting cortisone/steroid injections for your heel. There is an increased risk of weakening the arch tissue with steroid injections. 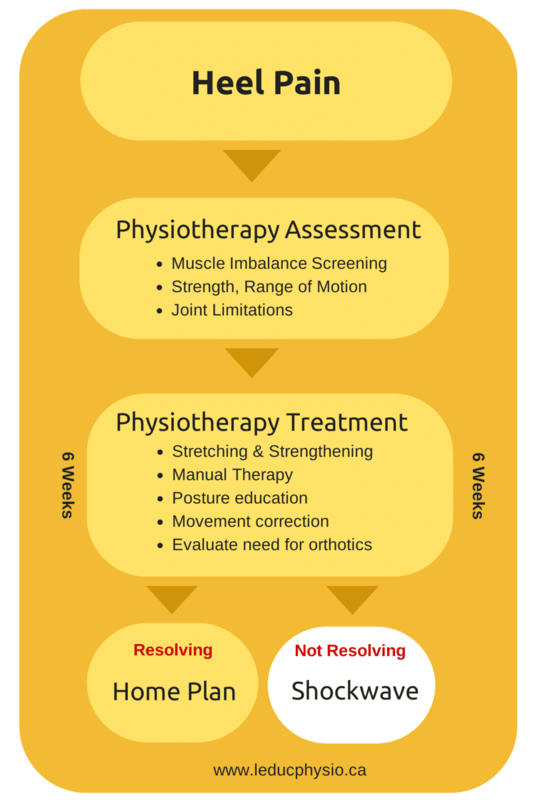 We’ve put together a little visual that can help you know where shockwave could fit it on your path to full recovery. If you’re interested in learning more about shockwave therapy at Leduc Physio, please visit here . Need custom orthotics? We’ve partnered with The Orthotic Group, one of the world’s leading orthotic providers. Want to read about the latest research in plantar fasciitis? Visit Rob’s blog from New Leaf Physio here.